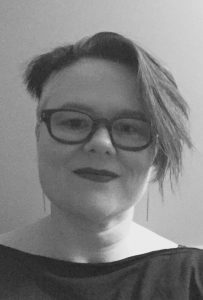 Sara Ryan is the author of the graphic novel Bad Houses with art by Carla Speed McNeil, young adult novels The Rules for Hearts and Empress of the World , and various comics, short stories, and essays. She is a faculty member in the MFA in Writing for Children and Young Adults at Vermont College of Fine Arts. She grew up in Ann Arbor, Michigan and now lives in Portland, Oregon. I was very lucky to grow up the only child of librarian parents who told me to “Look it up!” when I wanted to know something, and gave me books and blank books for any and all gift-giving occasions. I can’t remember if keeping journals or writing stories came first, but I started doing both early on, and haven’t stopped. 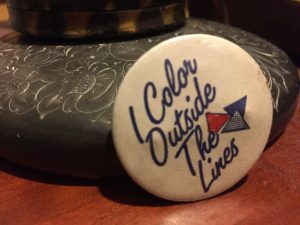 First pride pin I was brave enough to wear, circa early 1990s. Growing up, reading was sometimes a shared experience; I’d listen to my dad going hoarse doing orc voices while he read to me, or avidly discuss with friends the latest volume in the fantasy series we were obsessed with. But it was books I read alone, and didn’t talk about with anyone, that helped me understand more about who I was. Like the titles at the women’s bookstore that I’d furtively page through, or the ones in my college library that I’d grab quickly off the shelf and read in an unoccupied study carrel, glancing up every so often to make sure no one was looking over my shoulder. It took me a long time to get up the guts to take them home, or tell anyone about them. I want to write both kinds of books: the kind you want to share immediately with family and friends, and the kind you want to take into a corner to read by yourself, and think about. Some themes I keep coming back to in my work: mentors, and how they’re always flawed; keeping and revealing secrets; friendships that move into love or vice versa; how people change their behavior based on the contexts they’re in; and families, both biological and chosen. I’m working on a book now that incorporates all the themes above, but is also in some ways a departure from my other work. That’s all I’m going to say. I’m working on it!